Zheng Jiang is an artist. Mocube is pleased to announce the opening of artist's Zheng Jiang’s exhibition "Feitsui" on March 16, 2019. This exhibition will continue to May 12, 2019. In Jinyun County, Zhejiang Province, there is a col called “Shixia” which because of mining stones. These stones are mainly used for building houses, arbors, graves and coffins, etc. Zheng Jiang said: “I was born in this col. My father had been cutting stones in the mountains since the early '60s, which was the main source of income for our family at the time.” In the late 1990s, due to the rise of red brick and other building materials, the local rock digging industry entered the history. Now these ancient caves, which are abandoned in the mountains, are slowly weathering collapse by the wind and rain baptism. 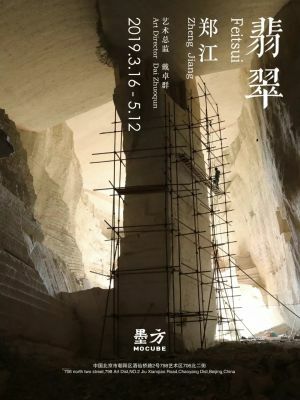 In this project, Zheng Jiang use these caves left by ancestors as a kind of space carrier, this is a continuation of the feeling and experience of light，a special substance which appeared in his previous works, let them talk at the same time between two spaces. Feitsui, the structure of these two Chinese characters is a metaphor for a kind of invisible link between people, items and emotion.